Chieftains of the ruling All Progressives Congress (APC), on Monday night, passed a vote of confidence on the leadership of the party. Gov. Abdulaziz Yari of Zamfara made this known at the end of a caucus of the party which was presided over by President Muhammadu Buhari. He said that the meeting also reinforced the unity, commitment and strength of all members of the party. “This meeting shows our unity in the party, shows our strength and our commitment to the party and to Nigerians,’’. Sen. Bukar Abba-Ibrahim, who also spoke on the outcome of the meeting, dismissed the speculation that it was convened to remove the leadership of the APC. He said: “You remember, you saw it in some of the newspapers. That our crises had deepened, APC is going to break, there is a plan to kick out our national chairman – none of these things happened. Mr. John Odigie-Oyegun, the party’s National Chairman, described the caucus as `very fantastic’, adding that the party would be stronger after its National Executive Council (NEC) meeting on Tuesday in Abuja. 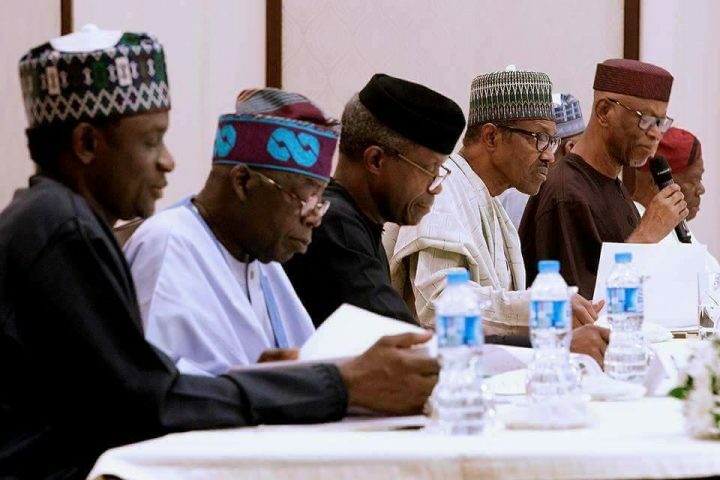 The News Agency of Nigeria (NAN) reports that the meeting was attended by Vice-President Yemi Osinbajo, Sen. Bola Tinubu, Bisi Akande, cabinet ministers and presidential aides. Governors of Plateau, Adamawa, Bauchi, Borno, Sokoto, Niger, Kogi, Jigawa, Benue, Ondo, Oyo, Ogun, Kebbi, Nasarawa as well as deputy governors of Kwara and Yobe states also attended the meeting. Members of the National Assembly including Senators Rabiu Kwankwaso and Adamu Alieru as well as the new Secretary to the Government of the Federation, Mr. Boss Mustapha also attended the caucus which lasted for over three hours. It noted that former Vice-President Atiku Abubakar was absent at the meeting, though a source said he might have traveled out of the country.